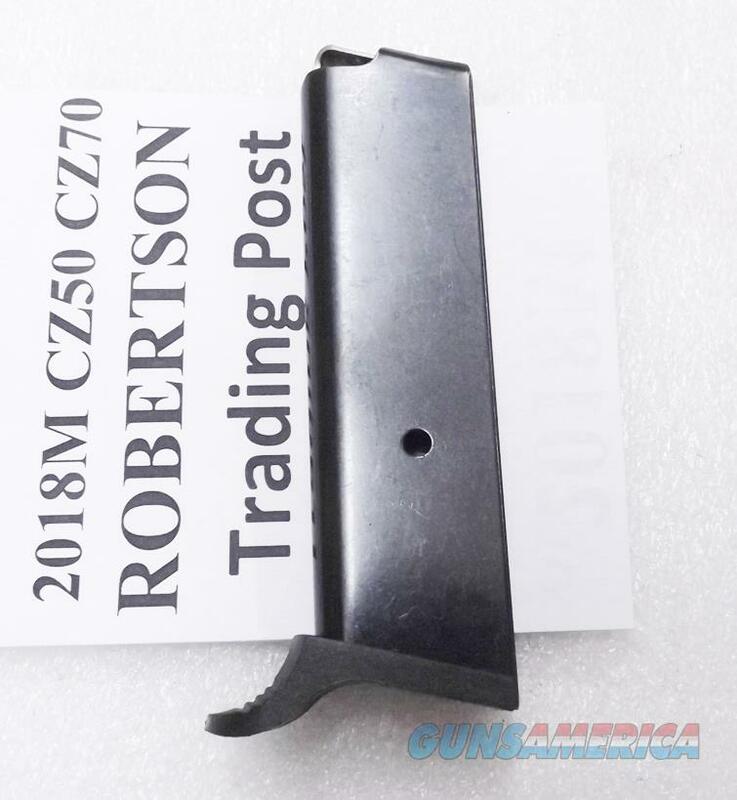 CZ50 CZ70 .32 ACP Triple K 8 round Magazine Ported Blue Steel 2018M Czech 32 Automatic Pistols Buy 3 and Shipping is Free! Description: NO MAGAZINE SALES into NEW YORK CITY. Connecticut buyers must furnish FFL or State Permit copy. This listing is for ONE magazine. Buy 3, however, or any 3 non gun non ammo items, and shipping is FREE for the entire order, lower 48. Here are Triple K #2018M, blue steel magazine to fit the Czech Made Ceska Zbrojovka CZ-50 and CZ-70 Pistols chambered in .32 ACP or 7.65mm Browning Caliber, The 32 Automatic caliber. Manufacturer and Warrantor is Triple K, Inc., of San Diego. Construction is blued steel body with round count ports on both side, steel cartridge follower and spring, and high impact polymer finger rest type floor plate. Each magazine holds 8 rounds or cartridges of .32 ACP Caliber ammunition. This magazine will NOT fit a Zastava Yugoslavia pistol, No Crvena Zastava; those are a different bird, a single action only Tokarev type pistol. The original CZ-50, CZ-70 is a very distinctive, Walther type pistol in double action. One of our photos shows a comparison between the Czech Police Issue magazines with smaller finger rest and these, with extended finger rest. Any shoppers who are unclear on whether their CZ 70 is Yugoslavian or Czech should enter Go ogle terms Zastava model 67 70 Pistol Wiki or Ceska Zbrojovka model 50 70 and look at the photos. We’re offering these brand new Triple K the Czech made CZ50 or CZ70 pistols, each	for only $ 29.00. Not for sale to residents of New York City. Any magazine deliveries into New York City require written permission from the Police Commissioner, so we cannot ship magazines into any of the five boroughs or 176 some odd zip codes, per NYC Code 10-131.10.Connecticut buyers must furnish FFL or State Permit copy.